The Australian state of Victoria has been scorched with several days of temperatures over 40C in recent weeks, and combined with a record drought and strong northerly winds, the fires everyone feared have arrived. 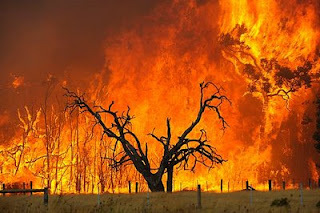 But these are worse than any in Australia's history, surpassing the terrible fires in 1983 and 1939 which killed dozens. I'm from country Australia. The Ash Wednesday fires of 1983 would have taken our home and community if the wind hadn't changed. When it's over 40 degrees and the north wind is blowing, you just pray a fire doesn't start. Thankfully this time, no fires are within 50km of my relatives but thoughts are with everyone affected by it, those who have lost loved ones or homes, and to the brave firefighters. Entire towns have been destroyed, hundreds of homes and worst of all, over 100 lives have been lost, mostly people trapped in their cars as they tried to escape. To the right is a button linking to the Australian Red Cross. Please donate if you can. I'm donating all of last week's profits, and it was my best week in a long while. Please be patient if the site is overloaded. For news updates, visit the HeraldSun. Photo from News Ltd.